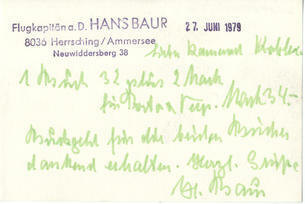 This is a Hand Written note dated 27th June 1979 and signed by Adolf Hitler's personal Pilot. The Overall size is 4" x 2.75". General Hans Baur (19 June 1897 - 17 February 1993) was German dictator Adolf Hitler's pilot during his political campaigns of the 1920s and 1930s. Appointed Gruppenfuhrer in the SS, Baur was later Hitler's personal pilot and leader of the "Reichsregierung" squadron.